David: Oh hi, Mia. Sorry I'm a bit late. Mia: Oh. No problem! Thanks for agreeing to help me with my assignment today. I really needed to go over it with someone. David: Sure. You were going to talk about European rock art, weren't you? Mia: Yes, the rock drawings in the caves of Lascaux in western France. David: Oh, fantastic, over 13,000 years old, I believe. What sort of drawings are they? Mia: They're drawings of animals on the whole, but you can also find some human representations, as well as some signs. There are roughly 600 drawings at Lascaux. David: Really? Were they mostly pictures of bulls? David: Oh, OK. That's interesting, isn't it? Mia: ...and the third most commonly drawn creature was the stag. There were some other animals but these are the main ones. David: What are the drawings like? I mean, what sort of style? Mia: Well, the bulls are depicted very figuratively - they're not very realistic. They are very big by comparison to the other drawings, of people and signs. They appear to be almost three-dimensional in some cases, following the contours of the cave walls, but of course they're not. David: Amazing. Perhaps they felt these animals were the most impressive and needed to be represented like that. Mia: Yeah, maybe. The drawings of humans by contrast consist of just simple lines. Like the stick figures my little sister draws. Perhaps humans were seen as less important. David: Mmm, perhaps. What about the signs. How did they draw them? Mia: There doesn't appear to be much evidence of signs, and those that have been found are usually made up of little points. David: Rather like Aboriginal art from Australia. Mia: Yes. Something like that, but not as complex, of course. David: So apart from the bulls and horses and stags, were there any other creatures depicted? Mia: In one or two chambers, you do find pictures of fish but they're quite rare. David: What sort of size is the cave? It must be quite large to have that many pictures. Mia: Well, it's actually a number of inter-linking chambers, really. Here's a map showing where the different drawings can be found. David: Oh, good. Let's have a look at that. Mia: The first 20 metres inside the cave slope down very steeply to the first hall in the network. That's called the Great Hall of the Bulls. Mia: Then off to the left we have the Painted Gallery, which is about 30 metres long, and is basically a continuation of this first hall. David: But further into the cave. Mia: Exactly. Then we find a second, lower gallery called the Lateral Passage. This opens off the aisle to the right of the Great Hall of the Bulls. 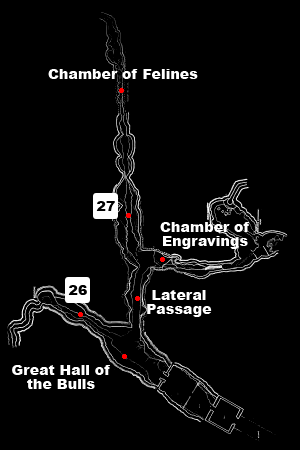 It connects the next chamber with an area known as the Main Gallery. At the end of the Main Gallery is the Chamber of Felines. There are one or two other connecting chambers but there's no evidence of man having been in these rooms. David: Is the cave open to the public today? Mia: Well, no. Because after the initial discovery in 1940, it was opened and literally millions of people came through to see the drawings. Then in the fifties the experts started to worry about the damage being done to the drawings, and the government finally closed the Lascaux cave in 1963. Mia: It wasn't really the tourists that were doing the harm, but the fact that after thousands of years, the cave was suddenly open to the atmosphere and so bacteria and fungi started to destroy the pictures. You need a special permit to enter the cave now and very few people can get that unless they're scientists or have some official status. David: It's a shame, but I can see that they had to do something to protect the cave. So that means you can no longer see this rock art. Mia: Well, not exactly. What they've done is re-create the drawings in a man-made cave, which you can visit. Mia: Yeah, the authorities decided to reproduce the two best sections of the site so they've created a life-size copy of the Hall of the Bulls and of the Painted Gallery. It's just a cement shell, which corresponds in shape to the interior of the original. David: So now you can visit the caves without actually harming any of the 13,000-year-old paintings. You will hear two students discussing the subject of rock art. First you have some time to look at Questions 21 and 27. 21 Which graph shows the distribution of animals painted on the caves? .................... .
How does the woman describe each type of drawing? Choose your answers from the box and write the letters A-H next to questions 22-25. 28 The cave was closed in 1963 because. A the tourists had drawn pictures on the walls. B the air was harming the rock art. C so few people were visiting the site. 29 How does David feel about the closure of the cave? A He agrees with the decision. B He thinks it was a bad idea. C He has no views on the matter. 30 How can people enjoy the drawings today? A The government has re-opened the cave. B The drawings have been photographed. C A replica of the cave has been built.